My heart is pumping rapidly through my chest. With labored breathing, I scream out, “Don’t let him get me!” In just thirty-eight minutes, I’ll be dead along with ten others. Now just seven minutes…two minutes…fourteen seconds…my demise is imminent! A zombie outwitted us in just 60 minutes, and though I died and was unable to escape, it was the most exhilarating time I’ve had in a while. To celebrate my third year wedding anniversary with my husband, along with some other family members, I searched for something we would both enjoy and offer us togetherness as a team. Since we are eagerly awaiting the season premiere of “The Walking Dead,” which is exactly two months away, I knew the Room Escape Adventures: Trapped in a Room With a Zombie would be perfect! I was lucky enough to reside near one of the twelve cities where this event takes place. If you’re looking for a fun activity that requires some mental acuity and live near by one of the cities, I strongly urge you to participate. From a sociological and psychological aspect, it was amazing to see how people, based upon gender and even age, took on certain roles. 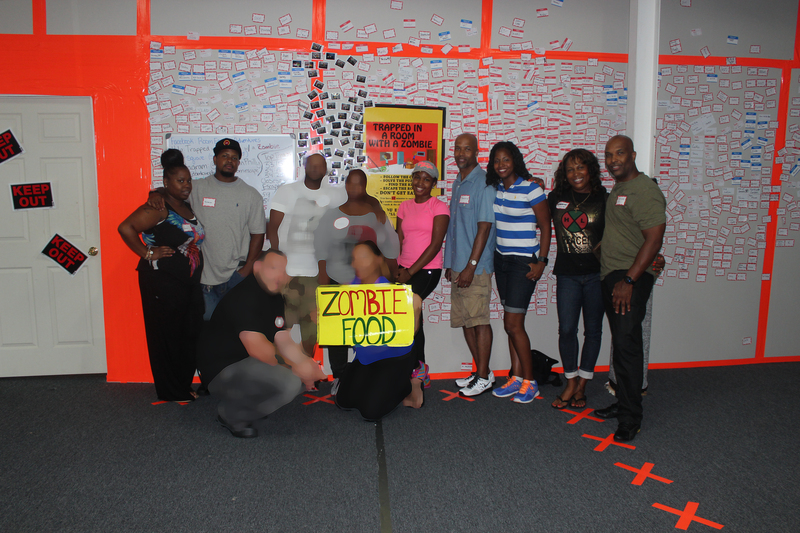 Most of the men became protectors and domineering problem solvers, while the women were more observant, noticed small clues and even distracted the zombie as some of the men attempted to figure out riddles to free us from the room. You don’t have to be an avid follower of “The Walking Dead” in order to get an adrenaline rush from being trapped in a room with a zombie, but it certainly does add to the intensity!